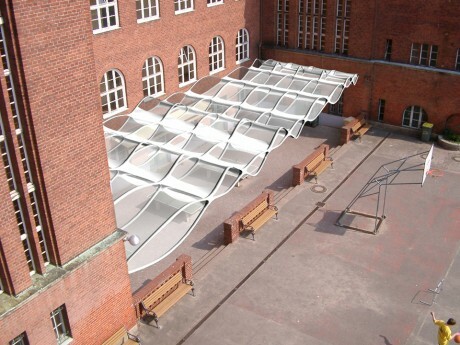 Schadow Grammar School in Berlin Zehlendorf will be given an airy textile roof providing weather protection. A cloud gets caught up in the courtyard of the brick tile building by Paul Mebes (1914) where a pergola used to be. It takes on the building’s regular classical details, capturing light, and swings upwards, turning into a shining ocean of waves. Its fabric consist of two layers, which generates chambers collecting and scattering light and diverting it into the courtyard. It provides the necessary weather protection and its interplay between light and shadow, sky and cloud makes the courtyard appealing at all seasons.